This is a scalable context timeline. 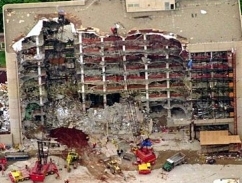 It contains events related to the event May 15, 1997: FBI Expert Testifies regarding Failure to Find McVeigh Fingerprints at Various Bomb Preparation Locations. You can narrow or broaden the context of this timeline by adjusting the zoom level. The lower the scale, the more relevant the items on average will be, while the higher the scale, the less relevant the items, on average, will be. 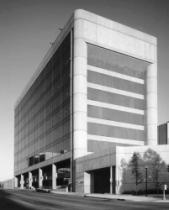 Timothy McVeigh (see November 1991 - Summer 1992, February - July 1994, September 12, 1994 and After, and September 13, 1994 and After) begins developing plans plans to blow up the Murrah Federal Building in Oklahoma City (see 8:35 a.m. - 9:02 a.m. April 19, 1995), echoing a plan developed by white supremacists in Elohim City, Oklahoma years before (see 1983). Federal authorities will later say that the “official” date of the conspiracy coincides with a federal ban on some assault weapons that goes into effect on September 13 (see September 13, 1994 and September 13, 1994), but McVeigh has been considering such a plan for some time. McVeigh uses the alias “Shawn Rivers” to rent a storage unit, Unit No. 2, in Herington, Kansas, at Clark Lumber, for four months at a cost of $80. The address McVeigh gives on the rental registration is Rt. 3, Box 83, Marion KS. McVeigh’s co-conspirator Terry Nichols (see March 24, 1988 - Late 1990, (September 30, 1994) and September 13, 1994) works in Marion, Kansas (see (September 30, 1994)). The clerk who rents McVeigh the storage unit is Helen Mitchell; the owner is Ray Mueller. McVeigh pays four months’ advance rent. During the latter part of September and the first two weeks of October, McVeigh and Nichols either stay at the Sunset Motel in Junction City, Kansas, or sleep in Nichols’s truck at Geary County State Park near Junction City. [New York Times, 5/9/1995; PBS Frontline, 1/22/1996; Mickolus and Simmons, 6/1997, pp. 810; Washington Post, 12/24/1997; Serrano, 1998, pp. 92; Douglas O. Linder, 2001] Nichols will soon buy a house in Herington (see (February 20, 1995)). Terry Nichols, conspiring with Timothy McVeigh to blow up a federal building in Oklahoma City (see September 13, 1994 and 8:35 a.m. - 9:02 a.m. April 19, 1995), rents a storage locker in Council Grove, Kansas, under the alias “Joe Kyle.” [New York Times, 8/29/1997; Washington Post, 12/24/1997] FBI investigators will later find a document in Nichols’s home with the location of the storage unit and the name Joe Kyle (see 3:15 p.m. and After, April 21-22, 1995). [PBS Frontline, 1/22/1996; Washington Post, 12/24/1997] Another source will later say Nichols may have rented the locker under the name “Ted Parker,” though FBI documents show that he used the “Kyle” alias. [PBS Frontline, 1/22/1996] Nichols and McVeigh are storing 3,250 pounds of fertilizer they have bought for the bomb (see September 23, 1994 and September 30, 1994) in another unit (see September 22, 1994), and explosives stolen from a Kansas quarry in a storage unit in Kingman, Arizona (see October 4 - Late October, 1994). Terry Nichols, conspiring with Timothy McVeigh (see 1987-1988 and November 1991 - Summer 1992) to blow up a federal building in Oklahoma City (see September 13, 1994 and 8:35 a.m. - 9:02 a.m. April 19, 1995), rents a second storage locker, Unit No. 37, in a Council Grove, Kansas, storage facility, using the alias “Ted Parker.” In October, Nichols rented a storage locker in Council Grove under the alias “Joe Kyle” (see October 17, 1994). [New York Times, 5/12/1995; PBS Frontline, 1/22/1996; Washington Post, 12/24/1997] Nichols is preparing to leave for the Philippines (see November 5, 1994 - Early January 1995). A former co-worker in New York identifies 27-year-old Timothy McVeigh, suspected of being the Oklahoma City bomber (see 8:35 a.m. - 9:02 a.m. April 19, 1995), as “John Doe No. 1” depicted in police drawings (see April 20, 1995). Authorities issue a warrant for McVeigh’s arrest, and quickly learn that he is under arrest in the Noble County Courthouse in Perry, Oklahoma, for misdemeanor weapons charges (see After 10:17 a.m. April 19, 1995); a check of McVeigh’s Social Security number matches one flagged by the FBI as belonging to a suspect in the bombing, a check made because McVeigh is from out of state. McVeigh is arrested by federal agents less than an hour before making $5,000 bail on the charges. “He came desperately close to making bail,” Assistant District Attorney Mark Gibson will later say. [Washington Post, 4/22/1995; New York Times, 4/22/1995; New York Times, 4/22/1995; New York Times, 4/22/1995; New York Times, 6/3/1997; Douglas O. Linder, 2001] This afternoon, Joe Wolfinger, the head of the FBI’s Buffalo, New York, office, calls Niagara County Sheriff Tom Beilein and asks him to run a background check on McVeigh, who grew up in Pendleton, New York, just below the US-Canadian border (see 1987-1988). Beilein will later report he finds nothing. Deputies from Beilein’s force along with state police officers meet with federal agents at the home of McVeigh’s father, Bill McVeigh, who is stunned by the news that his son may be the one responsible for the bombing. Police soon find themselves working to keep members of the local and national media from overrunning the house. A state police officer lowers the McVeighs’ American flag to half-mast. [Stickney, 1996, pp. 24, 179-180] It is likely that the former co-worker is Carl Lebron, who once worked with McVeigh as a security guard (see April 20-21, 1995).